Wow!! Is it ever cold outside. We have temperatures below zero and snow falling. I know many of you across the country are also experiencing colder weather than normal. With it being too cold to venture out, I've gotten tons of things marked off the "to-do" list. I've also taken some time for myself and enjoyed a good book, a spot of tea and chocolate. :-)) Let me show you one of the books I've revisited .. Welcome to Pink Saturday. Our gracious host each week Beverly fills the world of blog land with beautiful pink. I'm sure many of you have seen this tea set before. I have to say out of all I have, it is one of my favorites. I call it a floater, finding it's way around the house. This week, I chose the living area. 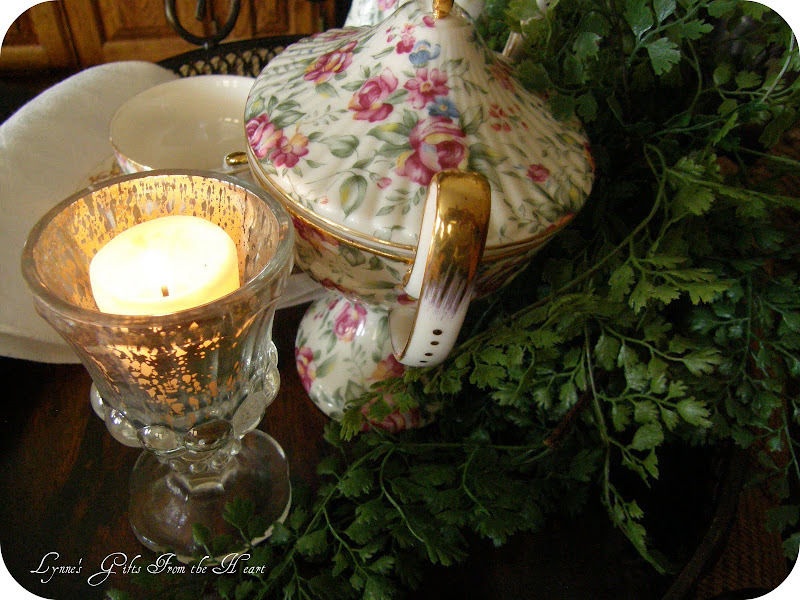 Setting on a tray with a vintage napkin and a bit of greenery, seems to warm my soul. 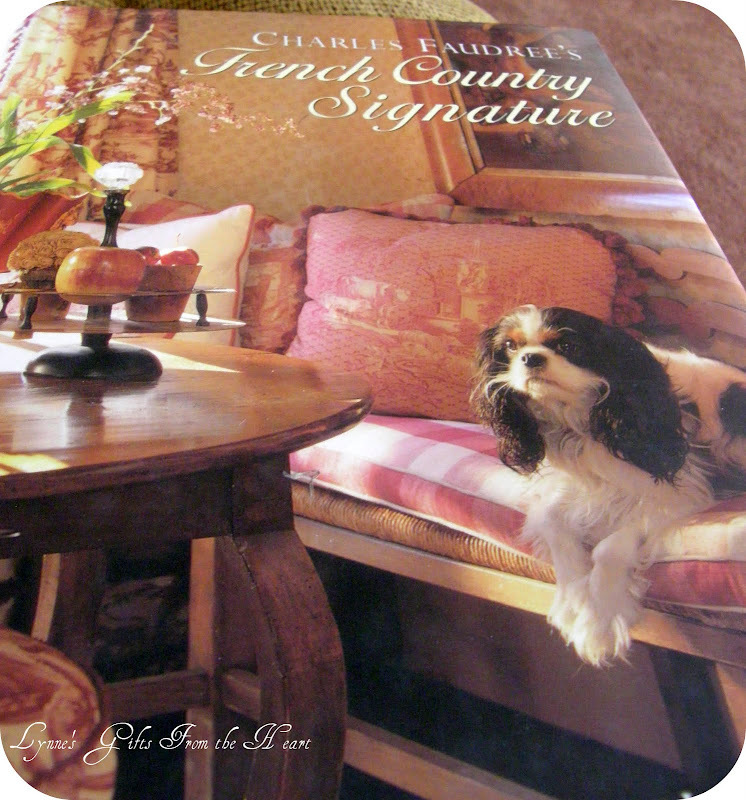 Charles Faudree has achieved an international reputation for creating all the elegant accoutrement's of a French Country Estate. As well as enjoying his great books and design style, I find myself living by one of his sayings, "too much is never enough." lol OK, I know many of you are minimalist, my daughter is one. I, on the other hand enjoy having my things around me. Warming my heart as well as my home. Charles was recently in the Kansas City area and due to my work schedule I wasn't able to meet him. I'm hoping he'll find the time to head back our way again soon. :-)) Many of you have already discovered this wonderful book, for those of you that haven't treat yourself. You won't be disappointed. 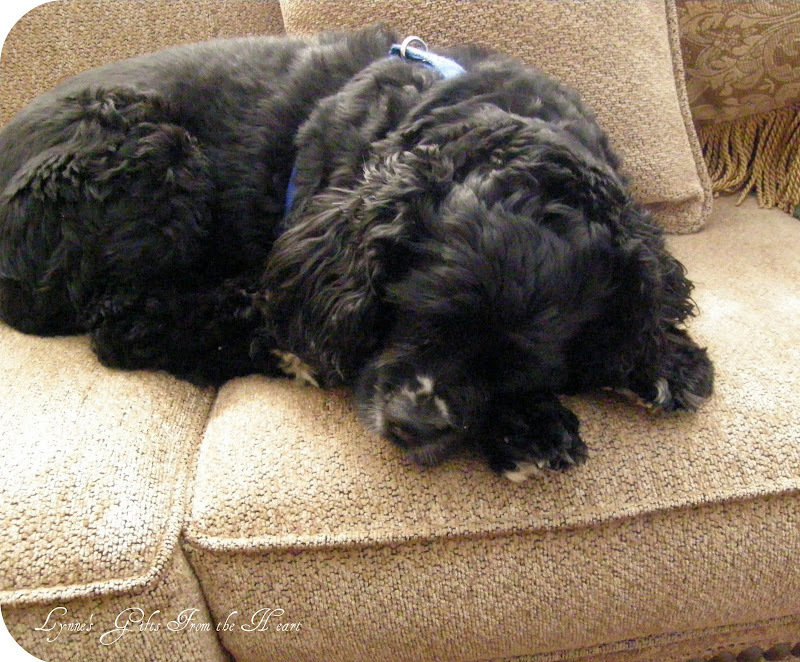 Nicholas, Charles' faithful companion, always camera ready. :-)) What a cutie! I enjoy the smell of a sweet smelling candle, don't you ? Thank you for joining me today on Pink Saturday. Be sure to swing by Beverly's for a full list of those participating. She has asked us to visit someone we haven't visited before. What a wonderful way for us to meet new blogger's. Beverly, as always, thank you for hosting this event each week. 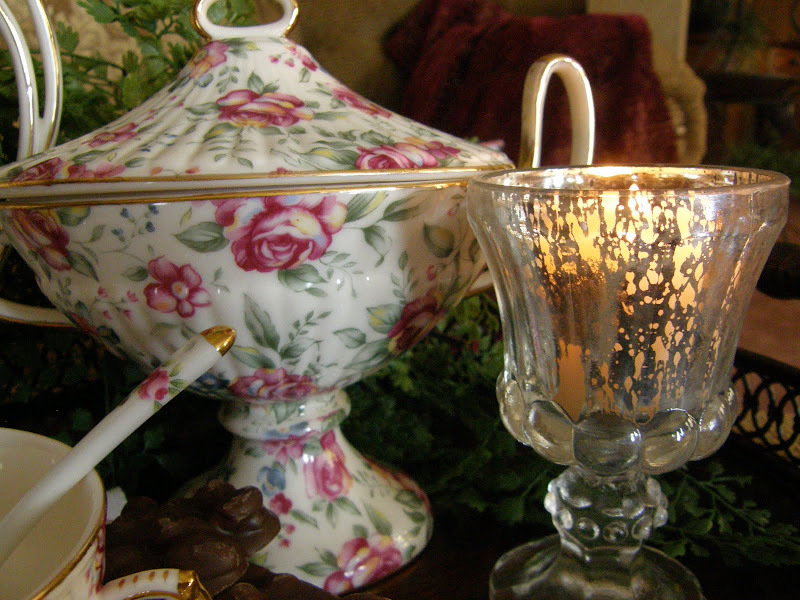 Cindy from Applestone Cottage is celebrating her One Year Blogaversary. It's always a milestone knowing we've been posting for a year. Be sure to swing over and help her celebrate her milestone. She is graciously giving away some beautiful things. Treat yourself by swinging over and wishing her a Big Congratulations and find out how you might win her give away! What a gorgeous post, Lynne! I have that book, too. I should revisit it, during these cold days. 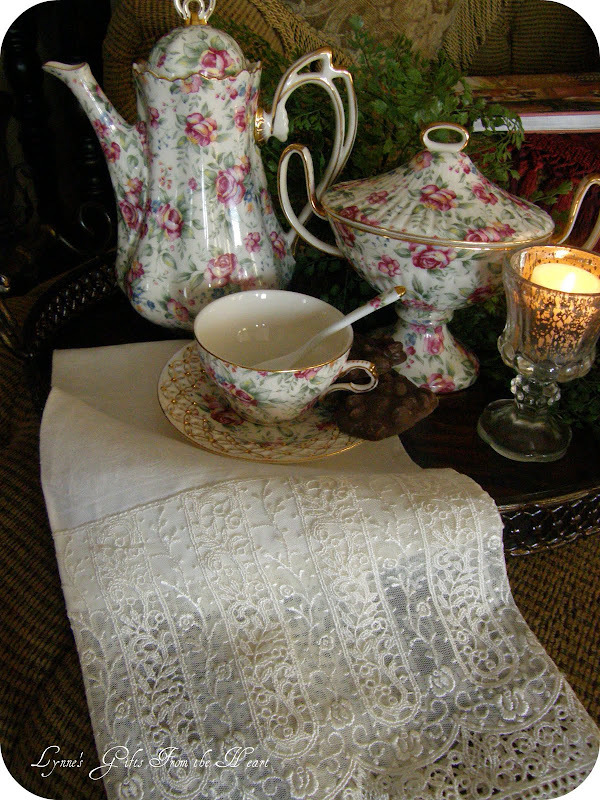 I can see why that teaset is a favorite of yours...it is lovely. Enjoy the reading and foofing!! Thanks for the peanut clusters..dont tell my hips..lolol. I am mezmorized by your beautiful napkin. Wow that is pretty!!! we are cold in Philly too..but i think you guys are getting the most coldness out there. Keep sippin that tea to keep warm or just snuggle with Miss Scooter. She looks like a cutie. I'm getting stir crazy at the office...I would so much rather be home working on my "to do" list! Lynne, thanks for coming by to see me. 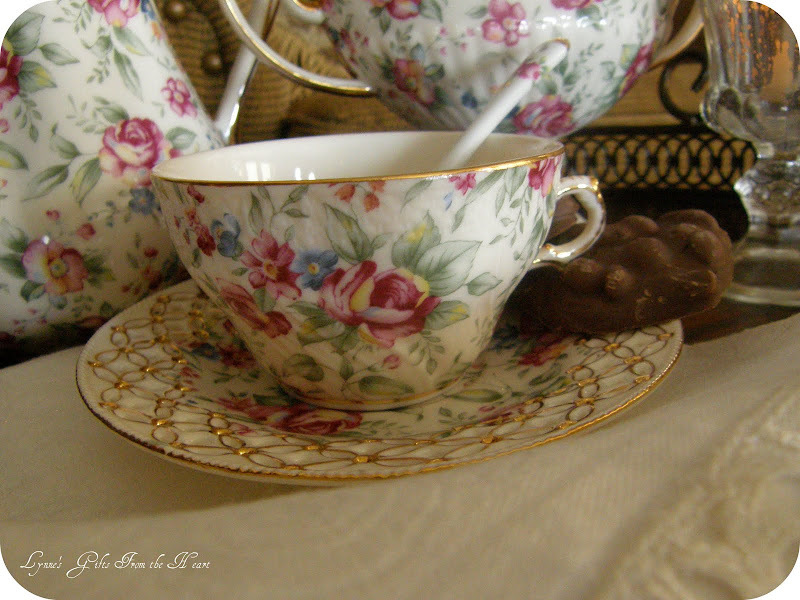 Your post is just lovely and thank you for inviting me to tea. I am a big tea drinker, just love it. 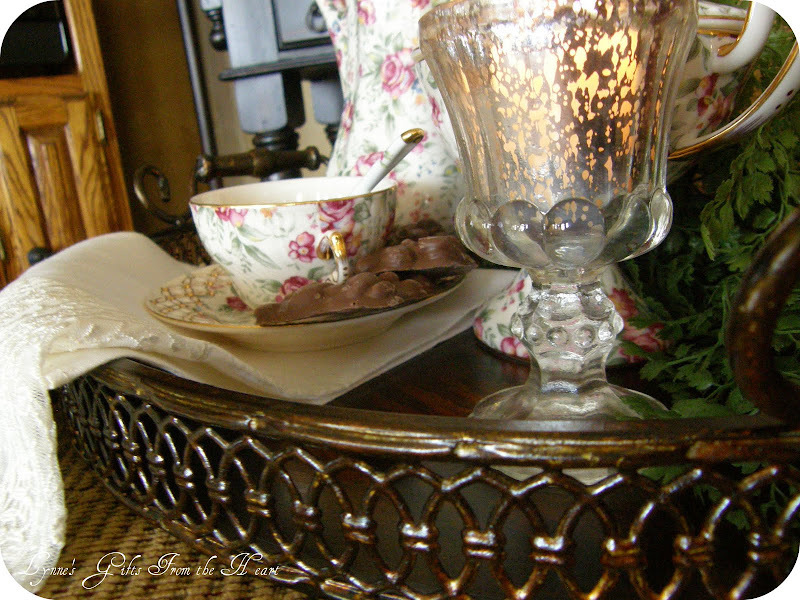 Your tea set is so beautiful and the mercury glass is also. I love mercury glass. Stay warm, here in Okla it is 6 degrees today. Whisk me away...Whisk me away! Your tea set is beautiful! Stay warm and give Scooter a big hug. 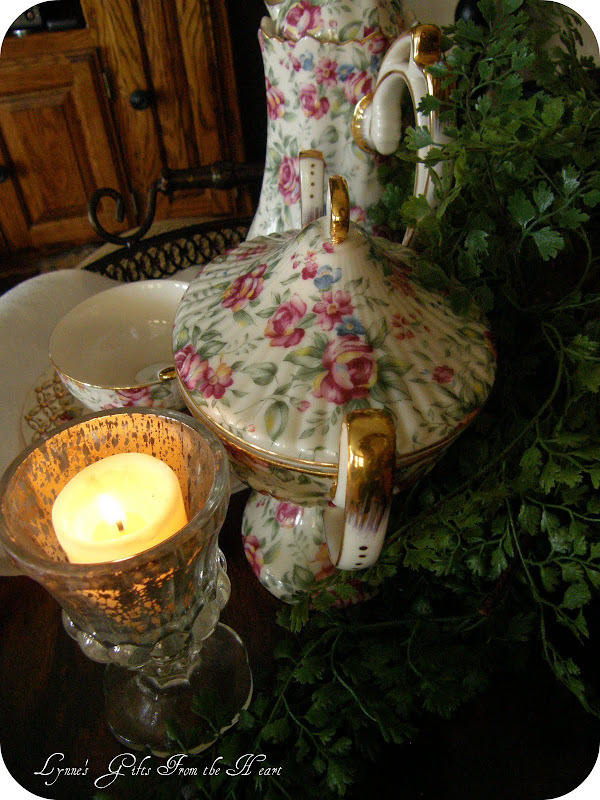 What a lovely teaset! I have several "floaters" in my house too. It's good to have things that will work well in different rooms. Also, your peanut clusters look divine! I'd love to help myself to one. Thanks for sharing! Thinking of you and hoping you and Mr P are having good days! 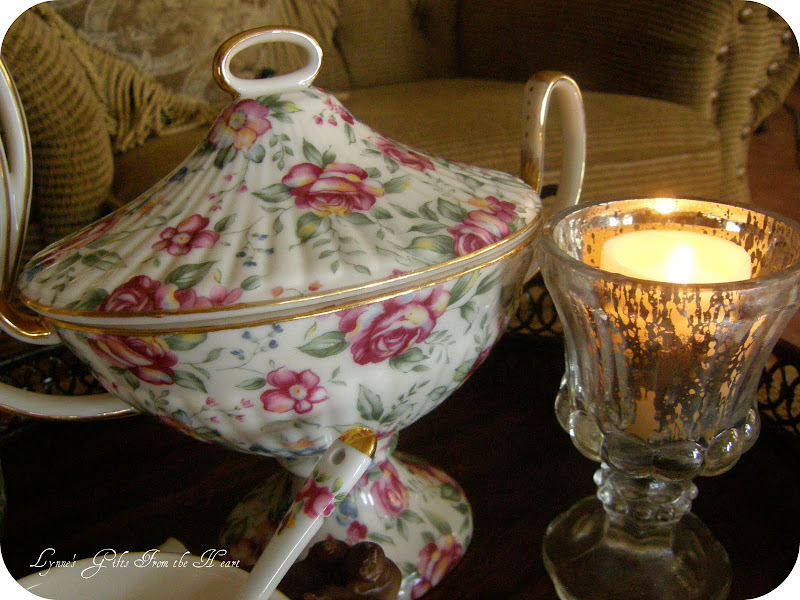 Your tea set is so beautiful and delicate!!! 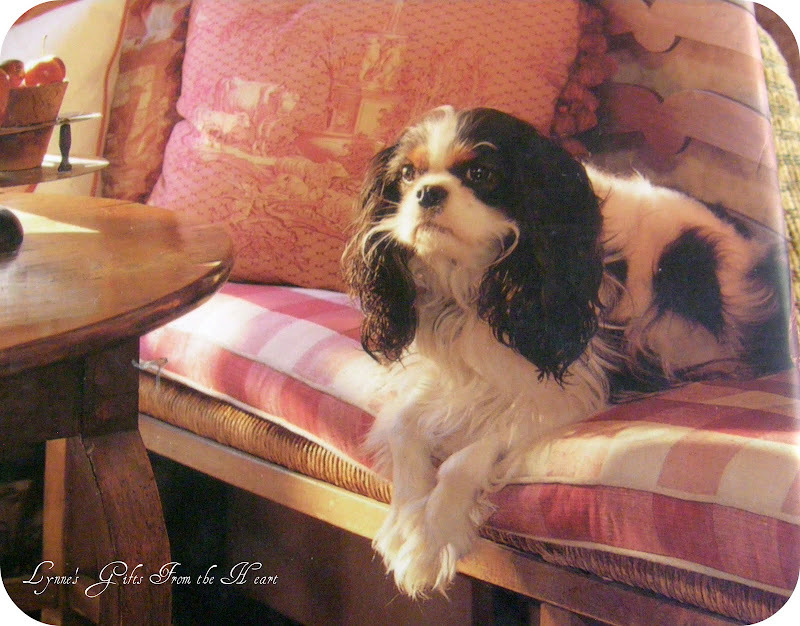 Charles' dog, the King Charles Cavalier, looks like mine...... I love those pictures. Bad weather certainly gives us opportunity to get on with all those projects we always say we are going to do. Personally I have had a hard time concentrating on many of them but have done some. Charles looks a fun companion to share your tea with. I will check this book out. Thanks for recommending it. 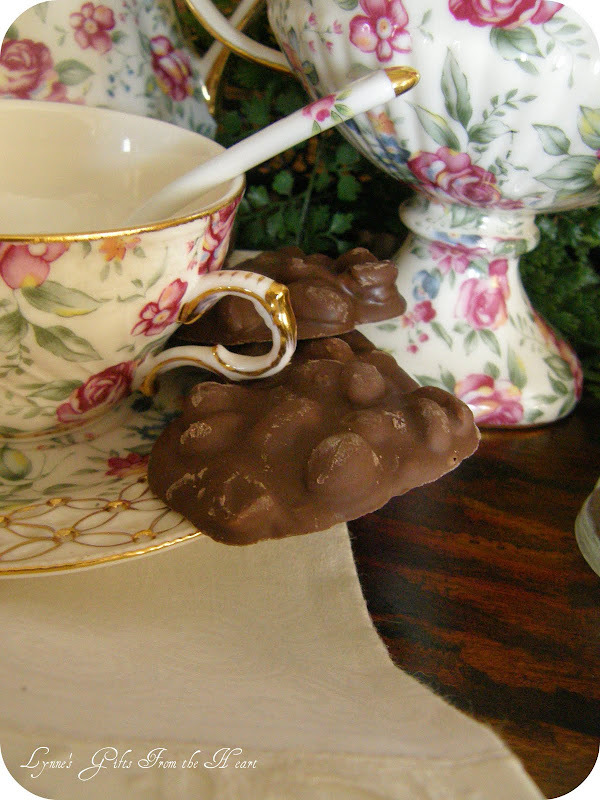 Oh if you are keeping track, I am having a spot of tea and a peanut clusters. mmmmmm yummy! 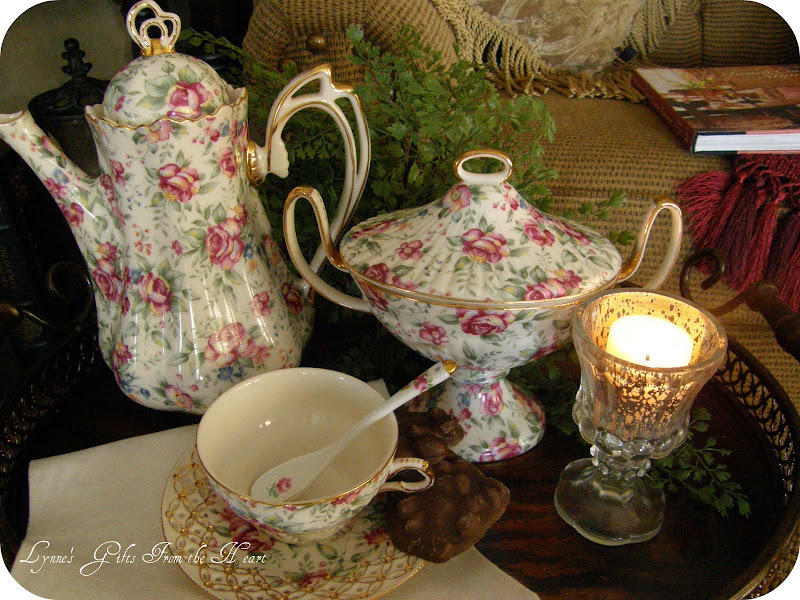 I love your tea set.....simply delish! And you pup is a cutie too..
How very pretty!! I will check out Charles' book. Looks like Nicholas the puppy has been at the cushions, though!! Hope you are staying warm and snuggled. Great book and teaset! Happy Pink Saturday! 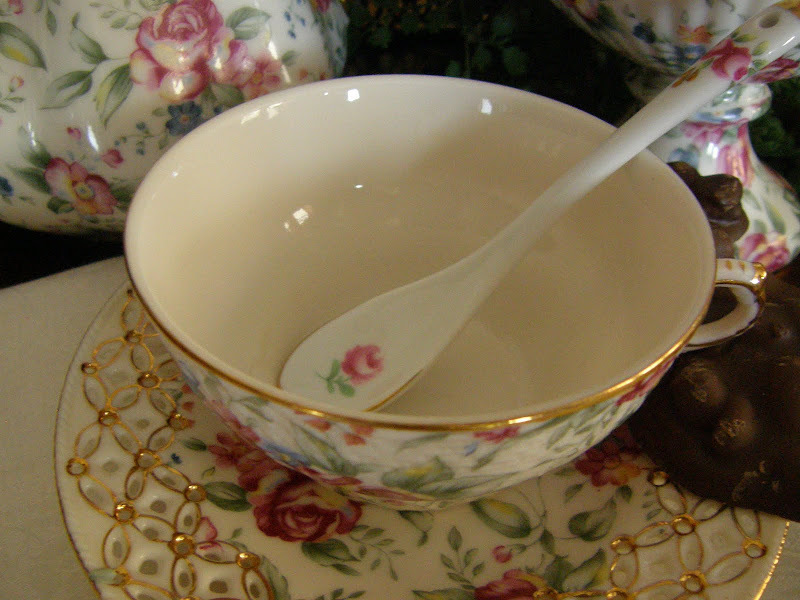 That's such a wonderful,gorgeous tea set..complete down to the tiny spoon in the cup. Happy Pink Saturday..have a wonderful weekend. ummmmm, may I have a peanut cluster please?? They're my very favorites. Such a pretty teaset and an adorable dog! Happy Pink Saturday! 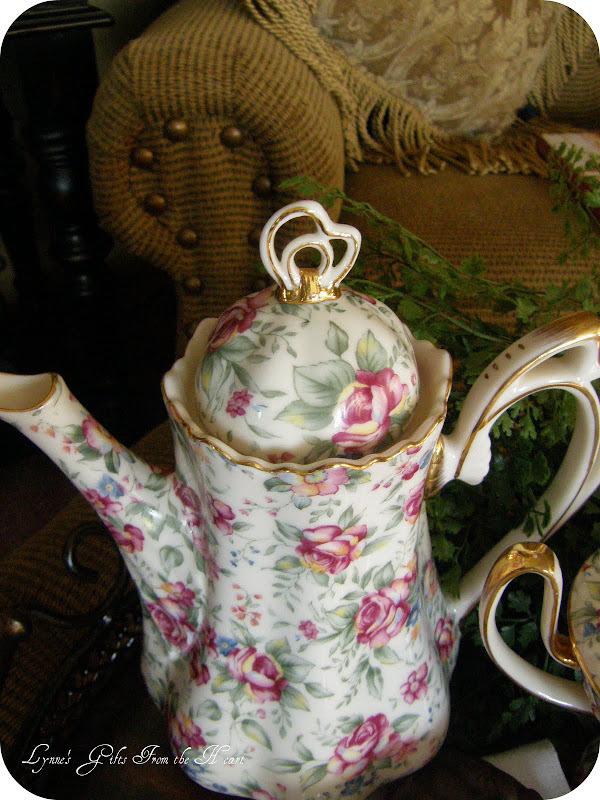 Lynne, Your teaset is gorgeous!!! And you did an amazing job beautifully capturing it with your photos! Great post! Miss Scooter is a sweetheart! Good Morning, Lynn! Oh, yes, your wonderful snow photos capture how very much of that white stuff we have had....even though it's so cold, it's still beautiful! Wasn't Charles D at Nell Hill's in Nov? That would have been fun seeing him! I don't have any of his books, but I do love to look at them in the bookstores.